Two boys stand in a South London playground, hunched over two handfuls of cards, comparing numbers and in turn whooping with delight or cursing with disappointment. Before you assume theyíre revising for their GCSE in Credit Card Fraud, let us introduce you to drug ad Top Trumps (Top Drugs). VI (visual impact): Speaks for itself. Does the ad blend unnoticed into the mÍlÈe of other commercial and editorial pages in the journal ñ or does it stand out and attract attention like a ginger kid in the school photo? CC (copy clout): Have the words been carefully considered and honed to deliver their message with brevity, clarity and style? Or is the ad laden down with flabby, opaque claptrap? CM (clarity of message): The adís main (sometimes overlooked) purpose is to deliver a message. Are the concept, art direction and copy singing in harmony from the same hymn sheet, or is everyone improvising independently of each other and a common theme (like the Year 7 jazz band)? The fourth category is the mysterious PF (popularity factor): Just as itís hard to define what makes a kid cool in school, a great ad is also much more than the sum of its parts ñ just think Ferris Bueller (good) or Rolaaand from Grange Hill (not so good). incongruous. Great cheesy overacting from the models! However, the headline, packshot and brand name are fighting each other for visual supremacy. Copy Clout: A neat headline works seamlessly with the visual; if only theyíd resisted putting in the brand name which just distracts from a good idea. Body copy is clear and concise with a direct and straightforward call to action. 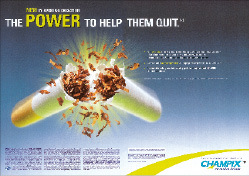 Clarity of Message: It is clear that ëAdditional Supportí in the form of behavioural techniques and communication technology are provided along with the ciggy patches, but exactly what is the product? If this is a revolutionary new product that GPs should try, it could do with a clearer explanation. Visual Impact: Lots of fresh, crisp, clean air that makes you wish you werenít sitting at your desk. This ad is bursting with stopping power, spoilt only by the choice of typography and mandatory purple silk scarf logo. Copy Clout: A very clever headline and economical body copy provides this ad with all it needs to say in a short space of time, allowing GPs to get on with their tea breaks. Clarity of Message: Clever headline. Powerful photograph. Clear communication. Visual Impact: There is an excellent idea at the core of this that has been perfectly art directed, photographed and retouchedÖ Like those magic eye pictures, it ainít half creepy when you see it. Copy Clout: Clearly demonstrates the dangers of an unhealthy diet, but itís not clear whether we should enjoy Xenical with cream crackers or without. Clarity of Message: This is the latest in a great series of ads, so the ad is justified in delivering its message with subtlety. Engaging and rewarding, the message (when you see it) is incredibly powerful. Popularity Factor: When it comes to pharmaceutical ads this one is the Big Cheese. seasons is cheerful and well executed, although the addition of the monthly labels, dividing lines and tablet pictures exceeds the realms of clarification and strays in to the patronising. Copy Clout: A simple direct headline explains the proposition perfectly, and the strapline reinforces the offering and declares the drugís exclusivity. The clarity of the words makes the overkill in the visual seem even more unnecessary. Clarity of Message: An amoeba who only understands Esperanto could get the message from this ad, so in many ways it fulfils its purpose admirably. Whether it does so by working in harmony with the readerís intelligence is, however, debatable. Popularity Factor: Short of making the reader write out ëBonviva is a monthly tablet for osteoporosisí a thousand times, this ad would struggle to show less respect for its audience. Good ads are often simple: the humans that view them are not. Visual Impact: You would think that a giant exploding fag would have a lot of impact over a double page spread especially with a green sunburst in the background and the big green POWER headline, but unfortunately when all these elements come together it can only make you do one thing. Quit looking. Copy Clout: The copy is clear, easily understandable, and presents the highlights of trial results simply. Clarity of Message: The headline and image go together fine in a ëSay what you seeí kind of way and the body copy serves its purpose. Popularity Factor: Smoking is not big and itís not clever; neither is this ad.